WEKAF USA held its bi-annual National Championships, where fighters from all over the country come and see if all there hard work, all the pain and beating they took and all the sacrifice made was worth it all. Held at Mt. San Antonio College in Walnut California, it was a picturesque location for the event. The weather was crisp and the day was bright and you can feel the anxiety in the air. You can see the focus in there eyes, even as they shake hands with there opponents. The mood is friendly as friends who only get to see each other every two years come and size each other up. Has he gotten bigger? Is she leaning on one side? All the same time they scout the newcomers with there ever observant eye. Who is that guy? What school is he from? Is he even in my weight bracket? The battle doesn’t begin at the mat, it begins with a hello, welcome to the Nationals. The WEKAF USA staff is hard at work, and even though this is a team of volunteers, there level of professionalism and organization could rival any professional sport. A fully computerized program, with a National Database checking to see if memberships are up to date and if they maintained there weight division. Important since this is an invitational tournament, you cannot just come in and say hey I want to fight. You have to first qualify in your regional tournament held all across the country. Once there you must either win 1st or 2nd place in your weight class to get the invitation. The lobby is buzzing with excitement. With vendors up and down the corridor with products and services that pertain to the fighters as well as it’s spectators. Things such as t-shirts and fight gear, all the way to the Grandmaster Sponsor Wilner & O’Reilly Immigration law to answer any and all specifics about any thing pertaining to Immigration. As each fighter prepares, there regiments differ. Some put’s on there headset and listen to music as they stretch and prepare there body for the physical challenge ahead of them. While others sit and calm the mind as they clear out all the noise all the distraction and focus on the challenger in front of them. Whatever it takes, is what you hear over and over again, for each fighter is different, each fighter has there own ritual, but all have one goal. 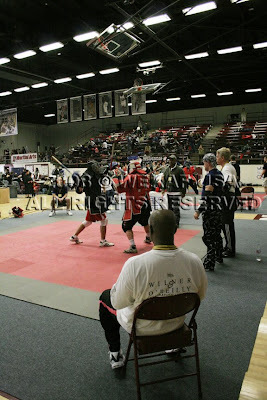 To become the 2008 WEKAF USA NATIONAL CHAMPION.